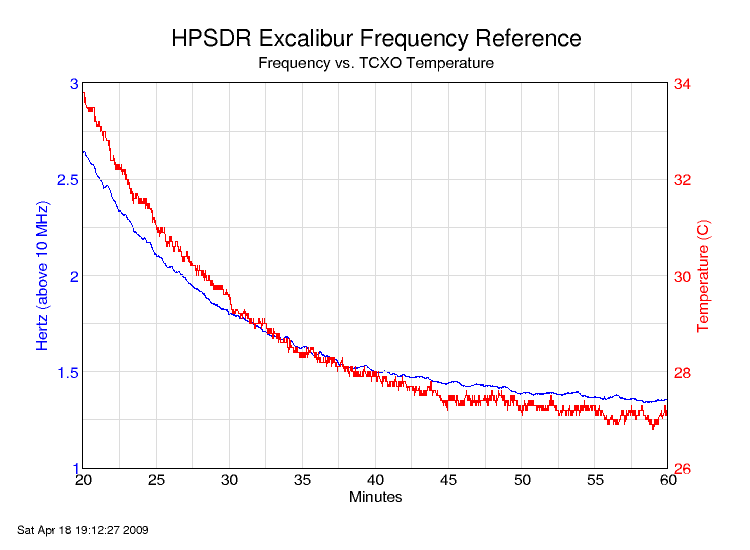 As part of the HPSDR project, Graham Haddock, KE9H, designed a plug-in card called Excalibur that provides a frequency reference for other HPSDR boards, using either an on-board 10 MHz oscillator, or an external 10 MHz source. 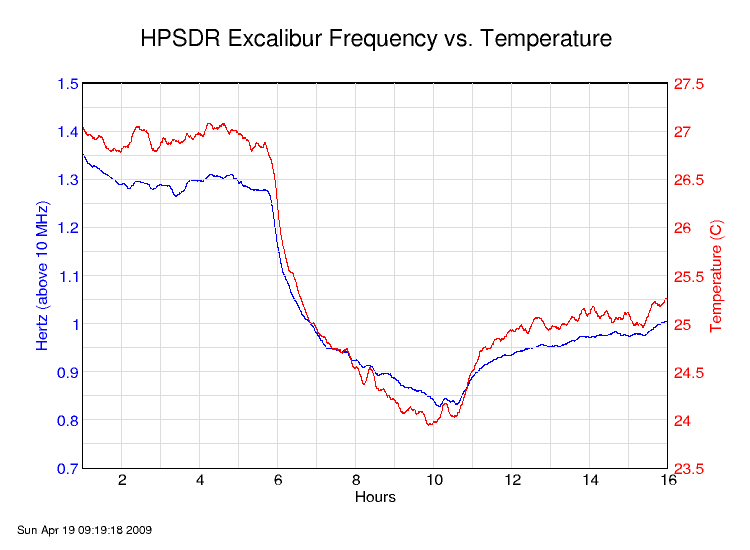 This page details the performance of Excalibur's on-board reference, a Crystek CHOX20-BP-10.000 temperature compensated crysal oscillator ("TCXO"). All measurements were taken at the Excalibur "OUTPUT" BNC. 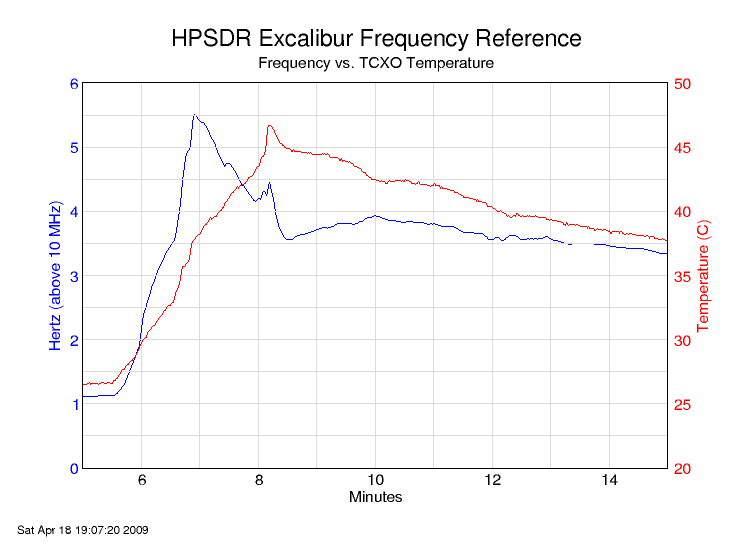 Excalibur was plugged into an Atlas backplane with no other HPSDR cards installed. A PicoPSU subminiature ATX power supply provided operating voltages, because the HPSDR LPU low noise power supply was not yet available at the time of the testing. Excalibur had been powered up for about 30 minutes at the beginning of the Allan Deviation test, and for more than 12 hours for all other tests. See the bottom of this page for a note on the equipment used for the measurements. The 10 MHz output level is +8.5 dBm into 50 ohms. That is 1.8 V peak-to-peak, or 630 mV RMS. The unloaded peak-to-peak voltage measured directly at the output BNC was 3.2 V.
The 2nd and 3rd harmonics are 41.3 dB down from the carrier. The 4th and 5th harmonics are 60 dB down. The only significant non-harmonic spurious signals noted were at +/- 300 kHz from the carrier, and were about 71 dB down. I suspect these are switching noise from the PicoPSU power supply. All other spurs (measured out to 200 MHz) were >75 dB down. Note that all these measurements were take from the sinewave output at the BNC connector. The low pass filter on that output attenuates harmonic and possibly other spurious energy. The 2nd and 4th harmonics are down 20.5 dB and 18.8 dB respectively. As expected from a square wave, the odd-order harmonics have almost no attenuation. The 3rd harmonic is down 5.6 dB and the 5th harmonic is down 7.7 dB. 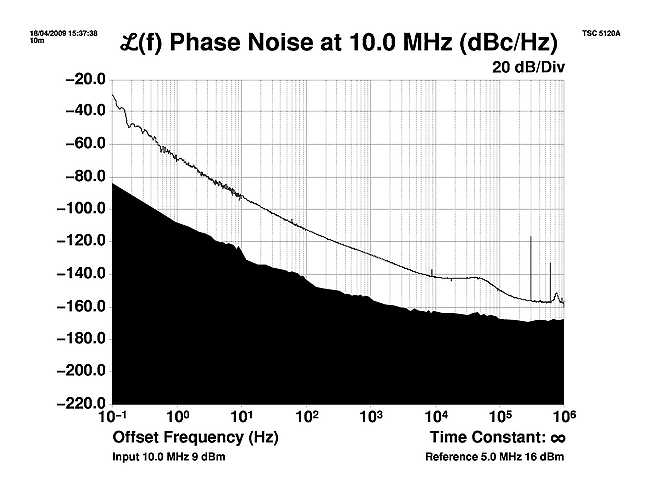 Here is a plot of the phase noise, again measured at the output BNC connector. This is somewhat better than the manufacturer's specification, and for a low cost oscillator is not bad at all. Here is the Allan deviation, measured over 12 hours. To interpret this plot, consider each data point the statistical likelihood that the frequency would vary by the amount shown in the vertical axis when measured over the time shown in the horizontal axis. Note that the scales are logarithmic. So, over a 10 second period the frequency could be expected to wander by about 3 parts in 1010, or 3 Hertz if the signal was multiplied to 10 GHz. Over 1000 seconds, the wander would be about 2 parts in 109, or 20 Hz at 10 GHz. Note that this measurement was taken in a relatively stable temperature environment, where the air temperature probably did not change more than a couple of degrees during the 12 hour measurement period. To test the TCXO's frequency stability over temperature, I set up an experiment to monitor the temperature versus frequency. I mounted a thermocouple thermometer on the top of the TCXO assembly, then used a computer program to measure the frequency and temperature simultaneously every second. There was a 0.5 Hz variation over a temperature range of 3 degrees C. That's about 0.16 Hz/degree. 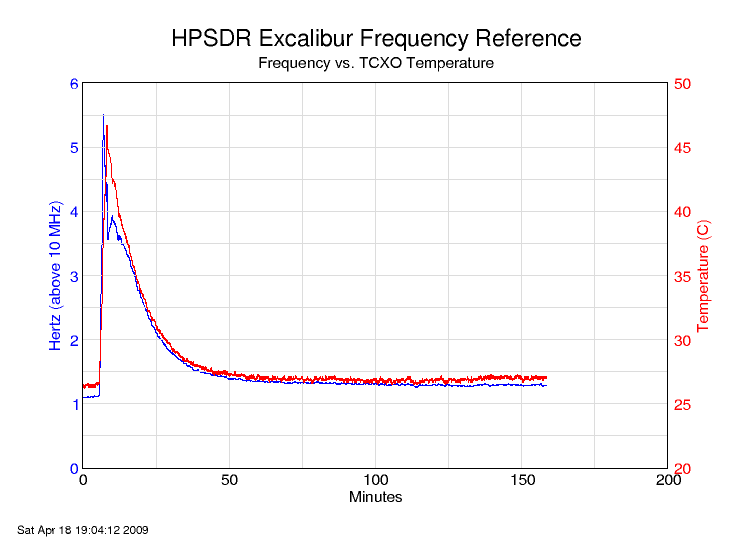 Given that the manufacturer specified a frequency shift of 1 PPM (10 Hz) over 70 degrees C (or 0.14 Hz/C), this performance tracks the spec pretty well. Note that to improve legibility, the data in this plot is thinned to one measurement every ten seconds, with a 60 sample rolling average applied. It appears that the rate of temperature change is greater than the TCXO can fully track, so it zooms up in frequency faster than the temperature is going up. It then catches up and compensates; from that point on, the two track fairly well. Tektronix 2465B and TDS 2012 scopes to measure P-P and RMS signal levels. HP 8566B spectrum analyzer to measure power level and spurious signals. Boonton 4210 power meter as a double-check on the power level. Symmetricom TSC-5120A test set to measure Allan Deviation and phase noise. 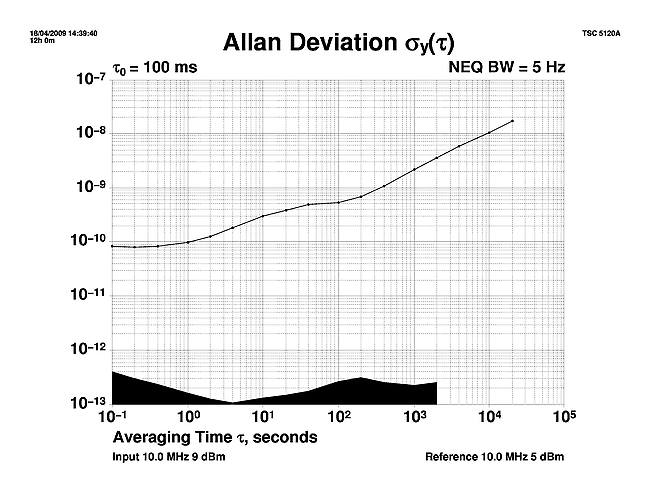 Reference sources were an HP Z3801A GPS disciplined oscillator for Allan Deviation, and a Wenzel 5 MHz ultra low noise oscillator for phase noise. HP 5370B counter and HP 3456A DMM with Omega thermocouple converter and type T thermocouple to measure frequency versus temperature. Both instruments were connected via GPIB cables to a computer running custom data capture software. The 5370B used a Z3801A GPSDO as its frequency reference.